Dr. Cynthia Morris and her team are committed to providing an excellent quality of dental care to everyone in our community. With a broad range of solutions available, you can be sure to find what suits your needs at our clinic. 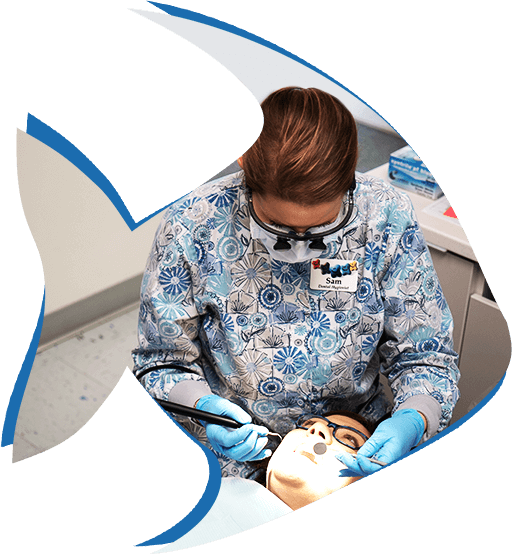 At Sea Brite Dental, you’ll find dental solutions to suit the needs of your entire family including general dentistry, restorative dentistry, pediatric dentistry, cosmetic dentistry, sedation dentistry, teeth grinding appliances and sleep apnea appliances. La Grande Dentist Dr. Cynthia Morris has been a part of our community since 1994, following her time serving overseas. She provides dental care for all ages with a focus on listening carefully to your needs, then detailing all your options for treatment so that you can decide what’s best for you. We want to guide our patients along the path of optimal dental health by delivering the highest possible level of care in a friendly, safe and comfortable environment. Through our team of professional, compassionate and committed staff members, we aim to provide patient health, confidence and overall improved quality of life. For many, the ocean has a relaxing, calming effect. After serving five years in the Air Force in Okinawa, Japan, Dr. Morris became captivated with the sea and wanted to bring its calming effects into her La Grande dental office. Sea Brite Dental seemed to be the perfect name for such a place. "My husband loves photography and has taken thousands of photos of the ocean. I wanted my office to have a very relaxing atmosphere for my patients, so you'll see many of his photos hanging on the walls." Thank you to Dr. Morris and Marie, for excellent care. Thank you for all the tips to improve my oral health it is greatly appreciated! Everyone in your office made me feel comfortable and gave excellent care. I was put immediately at ease, I really appreciate that as dentist experiences in the past have been fairly traumatic. Excellent staff of friendly, knowledgeable and helpful people. Took great care and worked hard to accommodate my difficult schedule. You are all so accommodating and helpful. What a pleasant experience. The staff is so friendly and helpful! I had an amazing first experience! Wonderful visit and I learned a lot! You guys were great! Thank you for making me feel comfortable. Everyone is very friendly and enjoyed my check up and cleaning. I feel I receive excellent care from Dr. Morris and her staff. All of you are great! I really appreciate all your help! Thank you for the experience with my kids. I really appreciated your caring staff!! My mouth inflammation has improved noticeably already! Thankful, grateful, and hopeful again! Thanks Sea Brite! Dr. Morris does beautiful work. Herself and staff are great to work with. I recommend her to all my friends and family. Everyone made me feel welcome and more at ease. Loved the personalities and sense of humor. I was really comfortable and felt welcomed. Are you overdue for your checkup? Have you been trying to ignore a nagging toothache? Whether you'd like a routine examination or have a specific concern you'd like to have checked out, we're here for you. Contact our dental clinic today!